Editor’s Note: This week’s guest post comes from Val Geisler, a content and customer success expert at ConvertKit. ConvertKit is an email marketing platform designed specifically for professional bloggers, and in this post Val explains exactly why everyone who blogs needs a sophisticated email strategy. In the ever-changing world of digital marketing, at least one thing remains true: staying in touch with your email list on a regular basis is one of the best ways to build relationships. And relationships with your subscribers attract new subscribers while turning subscribers into fans, fans into customers, and customers into evangelists for your company. Sending a newsletter every week or two is standard practice for most marketers. 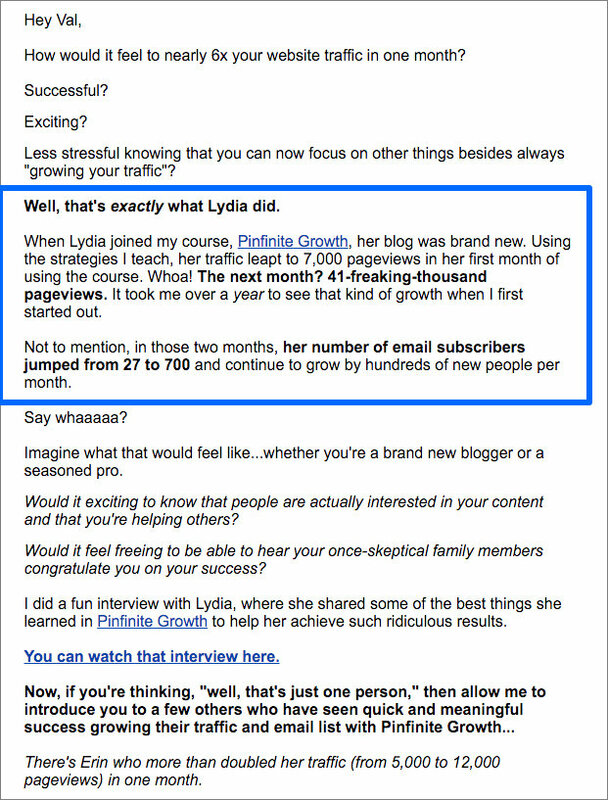 If you’re a blogger, you might even notify subscribers about every post. It’s a good start. 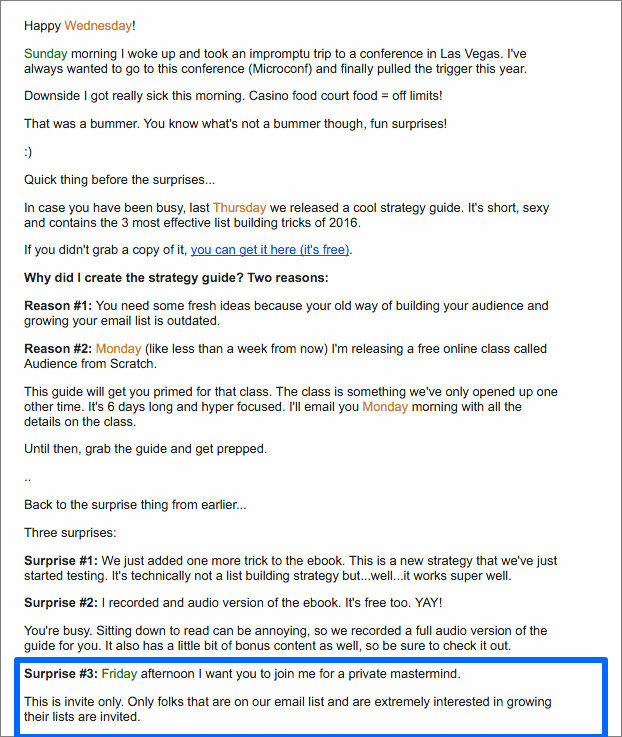 But if you want to make the most of that email list you’re working so hard to cultivate, a one-dimensional email marketing strategy like this isn’t enough. You can’t just send out newsletters and expect that those subscribers will turn into paying customers (or even that they’ll necessarily stay on your list). In this post, I’ll be sharing 17 kinds of emails that can help you get more out of your email marketing investment and your content in general, whether you’re a blogger or anyone else who publishes content online. You’ll find real-world examples of companies that are doing this well—sometimes delightfully well. Some of these kinds of emails are designed to help you get more eyes on your posts or visitors to your checkout page, plain and simple. Others are more transactional—and yet if you treat them as an afterthought, you’re missing an opportunity to reinforce your brand and your message. Handle these emails with care, and you may even find subscribers emailing you back just to say how much they liked them. If you have LeadPages™, you don’t need to download this template – it’s already available to you inside your LeadPages account. Just log in and you’ll see how super easy it is to customize this page in seconds with no technical knowledge or skills, make it mobile responsive, integrate it with your email service provider or CRM, run A/B split tests, and publish it to Facebook, WordPress, or your own server. 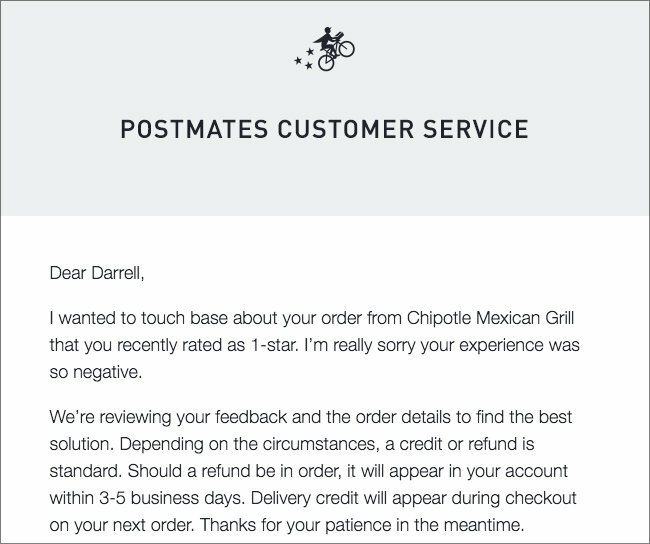 This email doesn’t just confirm that Postmates received data from a user—it also tells that user exactly what to expect next. 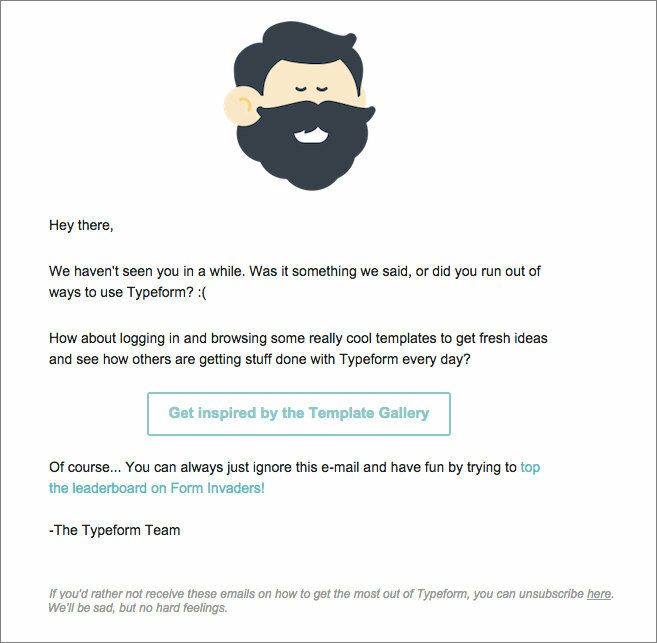 To get started with this kind of email, make a list of all the forms on your website and determine what happens when someone submits them. If an email is generated, take a look at that email and customize it so that it reflects the situation and a bit of your own personality. You’ll want to send this one right away—either with the incentive you’ve offered for joining your list or as a separate sequence automatically triggered when someone joins your list. Your new subscribers want to learn from you. Wouldn’t it be nice if you could know exactly how you can help them? You know that handy “Start Here” or “Resources” page you have on your blog? Turn it into an email and send it early on to your new subscribers (preferably right after the welcome email). Bonus points if you have a resources list and you include the same affiliate links you’re using on your website already. When someone subscribes to your email list, they are at the peak of their interest in hearing from you. 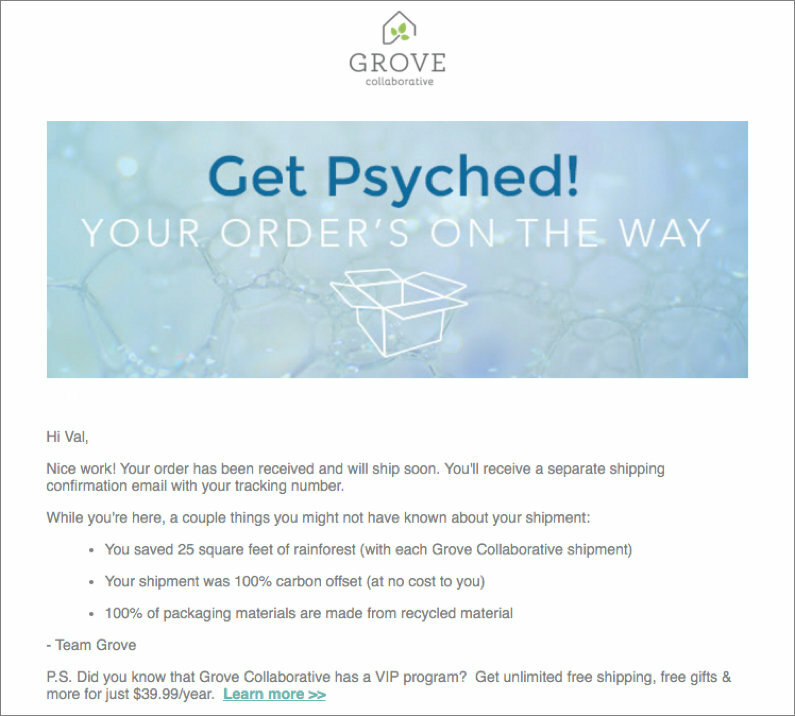 Take advantage of this interest and send them information about products you are launching early on in your new-subscriber sequence—or even promote an old product that’s collecting virtual dust. If you use email marketing software like ConvertKit, you can funnel your subscribers into a mini-sequence that orients new subscribers to the products you have available. 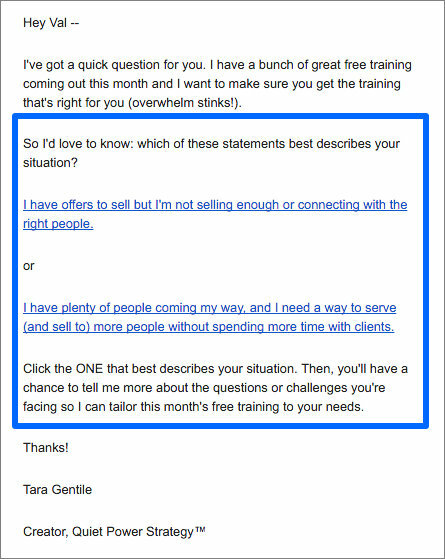 You don’t need to think of this email as a sales pitch—and in fact, you probably shouldn’t write it that way, at least not if it’s reaching brand new subscribers. Instead, consider presenting what you’re offering from a helpful or educational perspective. Begin by informing subscribers about a way to improve their lives, then segue into how your product can help them with that goal. A great way to grow your list quickly is to partner up with another blogger and do something together. A joint webinar, a product bundle, a cross-promotion with some good affiliate support … there are plenty of options. By promoting someone else’s products or events to your own email list (very occasionally), you establish yourself as a connector. Your subscribers start to see you as the go-to person on the topic you cover. Ditto when your pal promotes you. 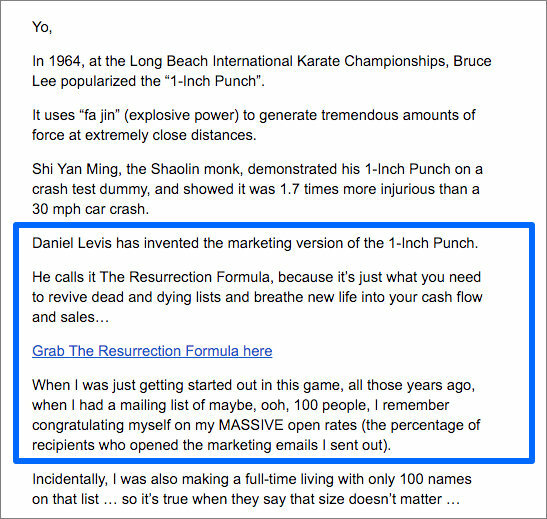 If you happen to be on his email list, you’ll notice that this email is written in Matthew’s usual irreverent style. It feels totally natural when he introduces his partner, Daniel Levis. Daniel’s product seems to be part of the story Matthew’s telling—not a discordant “now, a word from our sponsors” message. You’ve probably sent or received a number of these in your personal life, and if they’re done well, they help you feel more connected to people you love but may only see occasionally. 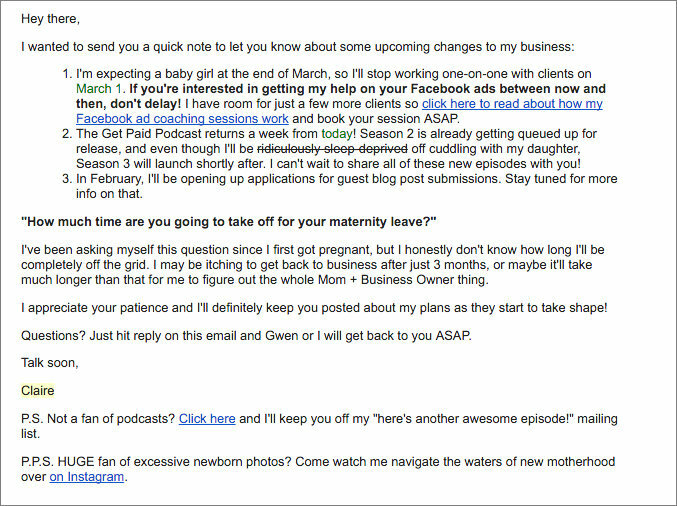 General update emails can serve a similar function in your marketing. 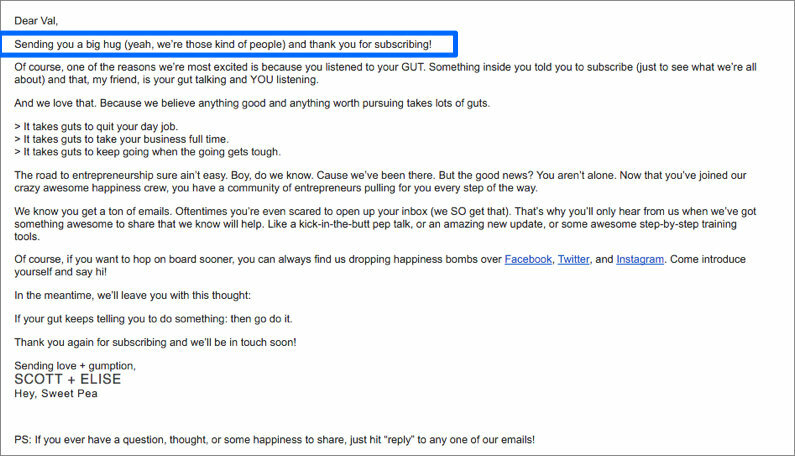 Things happen in life and business, so take the opportunity to tell your subscribers what’s going on. Having a baby or moving or writing a book? Or maybe you’re just taking two weeks off to care for a family member or have a staycation. Maybe you adopted a new puppy or painted your office! All these things could potentially impact the way you serve your audience, whether they change your posting schedule or just inspire a new endeavor. No matter what’s happening, sending a friendly email like this to your list reminds them that you are human and builds trust. Notice that this isn’t quite the kind of holiday newsletter you might get from your family. While Claire does talk about her personal life, she makes sure to connect every update to how it impacts her clients and audience. In other words, although this kind of email is about your life, it’s not all about you. If you have a robust email marketing system (like ConvertKit) at your fingertips, why not make the most of it? Ask subscribers to indicate interest in one of several products or topics using hyperlinks that correspond to tags in your email marketing system, then send targeted emails to those leads only. 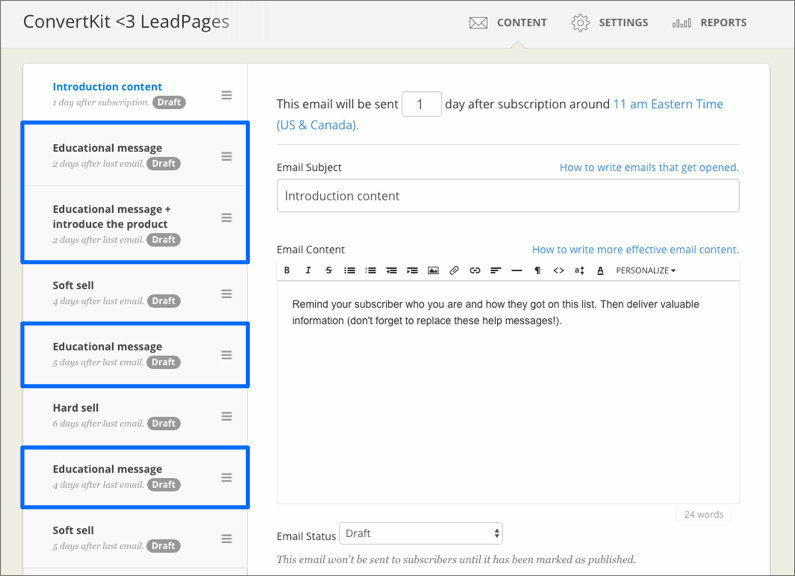 Editor’s note: If you use a list-based email service, you can also use Leadlinks® to move people onto different sub-lists. Who wants to throw a party and have nobody show up? If you already hold regular events, you’re probably sending invitations by email, but don’t stop at the subscribers who are local to the area. Ask your subscribers to tell their friends who live in that city that it’s a can’t-miss event. If your event is online, anyone can come, of course. In fact, if you don’t have any events planned, consider scheduling a laid-back Q&A webinar where your audience can interact with you in real time. It’s easy to promote and run, and it can really strengthen your connection to attendees. Your subscribers want to engage with you and learn from you. 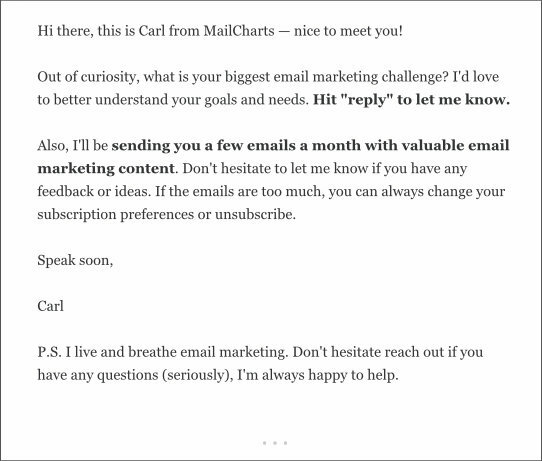 Use emails to them to teach everything you know (a ConvertKit tenet, by the way). Teach them a topic in a series over several emails. Or send them exclusive tips they won’t find on your blog. You can see that there are actually several spots marked for educational content: near the start of the sequence and after each sales push, reassuring subscribers that your list hasn’t suddenly turned into all sales emails, all the time. This one requires a few extra minutes to gather data, but it can be really fun. Each month you can pull all your subscribers who joined this month last year and send a little “list-iversary celebration” email. At some point, your list will start growing to the point that you have a few different types of subscribers. As your blog grows along with your list, you’ll start talking about different topics. Asking your subscribers specifically what they are interested in hearing more about (and using something like link triggers to tag them on the back end) will help you send more targeted emails to those specific subscribers (and build some diehard fans along the way). 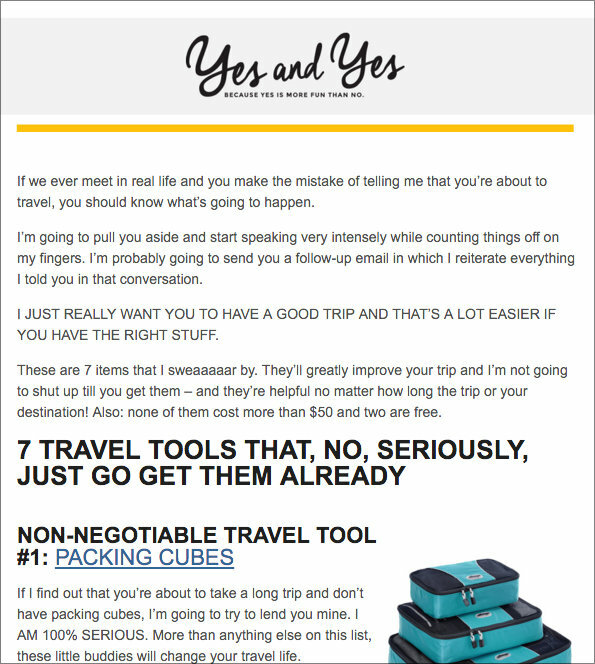 This kind of email is similar to the multiple-choice email above, but in this case, you’re actually using it so you can create better content, rather than just serving people different content you’ve already made. 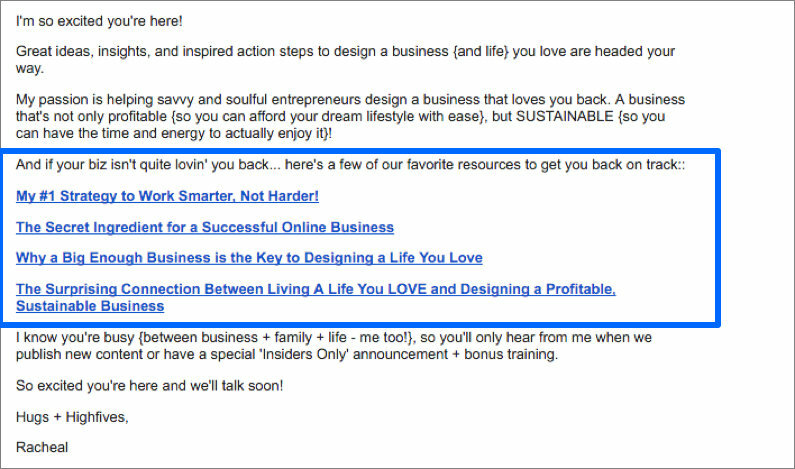 As a blogger, you’re obviously already emailing your subscribers about your blog posts at least occasionally. But to make them feel extra special, consider occasionally or regularly sending them your blog content in the body of the email. If you want to offer another extra perk to your subscribers, you can even make a habit of emailing them certain posts before they go live on your site. So the next time you sit down to write an email and think, “I have no idea what to send to my subscribers!”, just pull out this list and see what’s missing from your email marketing game plan. 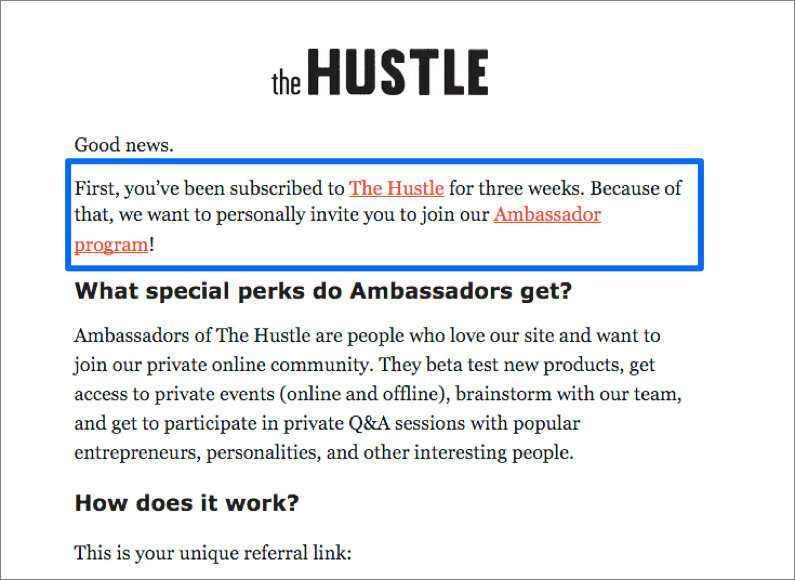 Don’t leave your subscribers hanging—or, worse yet, hovering over that unsubscribe button! Create a meaningful email marketing plan that will build your relationships and business for life. 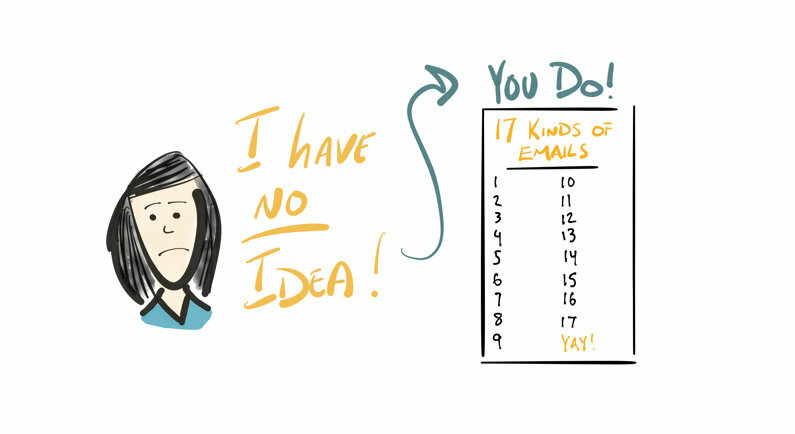 What other kinds of emails have you found valuable that aren’t on this list? Tell us in the comments!